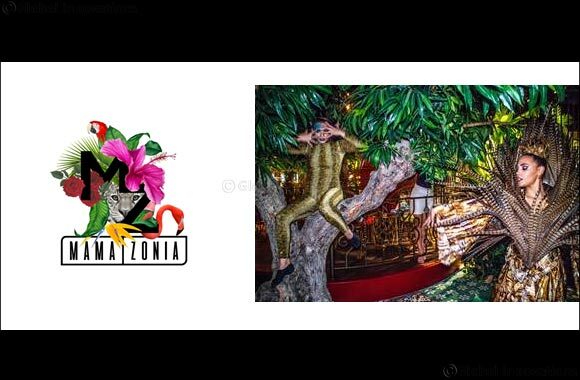 23rd January, Dubai, UAE: Ladies of the concrete jungle, it’s time to let your inner goddess roam wild at Dubai Marina’s hottest new ladies night in MAMA ZONIA, the tropical chic restaurant inspired by the spirit of the Amazon. Every Tuesday ‘GLAMAZON’ ladies night celebrates strong, independent women unafraid of pushing boundaries and challenging the status quo. From 6pm-1am every Tuesday, all GLAMAZON ladies receive two complimentary beverages, 50% off main courses and an additional two beverages when buying a main course. A selection of starters and desserts from the tropical inspired menu will also be available, making for a decadent feast exploring the daring flavours and tastes of the Amazon which looks every bit as good as it tastes. Ladies can choose from a selection of bold and exotic starters including tiger prawn rolls with avocado, salmon topico and red snapper ceviche with squid ink chips. For the main feast, mouth-watering mains such as lamb cutlets and 250gm Oyster blade Australian black angus will be served for a truly tropical experience. Desserts such as wild amazon chocolate pot with coconut sorbet will also be available because, GLAMAZON women only deserve a feast fit for a queen. Live entertainment including a DJ and tribal dancers will make for a mid-week celebration unlike anything Dubai Marina has seen before. Eat, dance and move to the beat of the drum at GLAMAZON ladies night every Tuesday from 6pm – 1 am. Offer: 2 free house beverages, 50% off mains and a further 2 free drinks with the purchase of any main.